1. Place the potatoes in a medium pot and cover with cold water by 1 inch. Salt the water and bring to a boil, then lower the heat and simmer until the potatoes are tender, about 15 minutes. Drain, then mash the potatoes in the pot. Cook, stirring, over medium-low heat for 1 minute. Let cool, stirring occasionally, for about 20 minutes. 2. Meanwhile, stir together the eggs and chives. Place the cornmeal on a large, shallow plate. 3. Combine the potatoes with the corn, the cheese and the egg mixture; season with pepper. Scoop out 2 rounded tablespoons and roll into a ball. Set on a sheet of waxed paper; repeat with the remaining mixture (you should have 30 pieces). 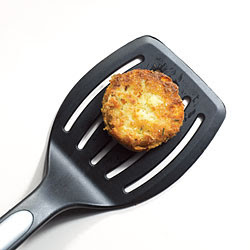 Flatten each ball into a 1/2-inch-thick patty, coat in the cornmeal and transfer to a baking sheet. 4. On a griddle or in a large nonstick skillet, heat 1/4 cup oil over medium-high heat. Working in 3 batches, add the corncakes and cook until golden-brown, about 2 minutes on each side. Transfer to paper towels to drain and season with salt.